From left: the Cohiba Robusto Reserva Cosecha 2014, Partagás Linea Maduro and Hoyo de Monterrey Le Hoyo Rio Seco. The Romeo y Julieta Gran Churchill led the parade of new cigars announced by Habanos S.A. at this morning’s inaugural press conference in Havana, kicking off the 20th annual Festival del Habanos. The 7 1/2 inch by 56 ring gauge cigar will be released in 100-count humidors made by Elie Bleu, the luxury French manufacturer. Four hundred and fifty humidors will be created. The other new cigars include the Cohiba Robusto Reserva Cosecha 2014, a rare, 5 by 50 cigar. Five thousand numbered boxes of the special edition Cohiba will be released. The boxes are reminiscent of the brand’s Behike packaging, with a black, piano-finish lacquer box imprinted with the brand name and the Reserva logo. The Partagás Linea Maduro will get two new sizes: the Maduro No. 2, a short pyramid measuring 4 3/4 inches by 55 ring, and the Maduro No. 3, a straight-sided cigar of 5 3/4 by 50. They join the Maduro No. 1, a 5 1/8 by 52 smoke first introduced in 2015. The new cigars will be sold in boxes of 25. Habanos also announced a new size in the value-brand Vegueros, the Centrofinos, a 5 1/2 by 50 cigar. Like the rest of the Vegueros brand, Centrofinos will be sold in square metal tins of 16. The Edición Limitada cigars for 2018 will consist of the Romeo y Julieta Taco, 6 2/3 by 49; Bolivar Soberano, 5 1/2 by 54 and an H. Upmann Propios, 4 3/4 by 46. The relative slim size of these ELs was intentional. José María López Inchaurbe, the vice president of development for Habanos, said the two thinner ring gauge cigars were attempts by Habanos S.A. to appeal to many smokers who prefer more classic ring gauges, rather than the thicker cigars that have become popular in recent years. The Romeo y Julieta Tacos, while having the word Tacos in its name, is not a standard Cuban Tacos vitola, which is a figurado measuring 6 1/4 by 47 ring. These ELs will be parejos, and will come in standard dress boxes of 25. The Bolivar Soberanos will come in wooden, slide-lid boxes of 10, and the H. Upmann Propios will be packed in wooden cabinets of 25. 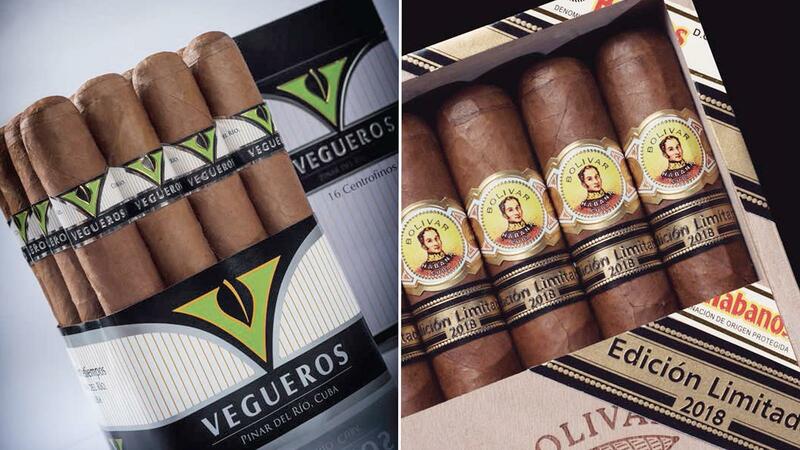 Habanos announced a new size for the value-brand Vegueros, left, while the Bolivar Soberano, right, is among the three Edición Limitada cigars for 2018. The final major launches for 2018 will be Casa del Habanos exclusives. One cigar will be a Hoyo de Monterrey Escogidos—7 by 49—and the other, a San Cristobal de la Habana Prado, a 5 by 50 petit pirámide. Both cigars will be sold in 10-count wooden boxes. No prices were revealed for any of the new launches. Habanos also announced financial results for 2017 during the conference. Leopoldo Cintra Gonzalez, the commercial vice president for Habanos, reported that the Cuban company had reached $500 million in sales worldwide, an increase of 12 percent from 2016. He said the global market for cigars exceeded 450 million units in 2017, and that Habanos, in countries where it sells its cigars, accounts for 70 percent of the units sold, and 80 percent of the value. A small footnote in the video presentations of the firm’s statistics noted that it does not sell cigars in the world’s largest cigar market, the United States. Cinta Gonzalez also reported that the top-five markets for Habanos products are Spain, France, China, Germany and Cuba, in that order. Overall, he added, Europe accounts for 54 percent of Habanos sales, with the Americas coming in second at 17 percent, China at 15 percent, and Africa and the Middle East at 14 percent. He said that Cohiba is the company’s biggest selling brand in terms of value, accounting for 23 percent of revenue, with Romeo y Julieta and Montecristo nearly identical at 17 percent. On a unit basis, Montecristo remains the best selling brand. 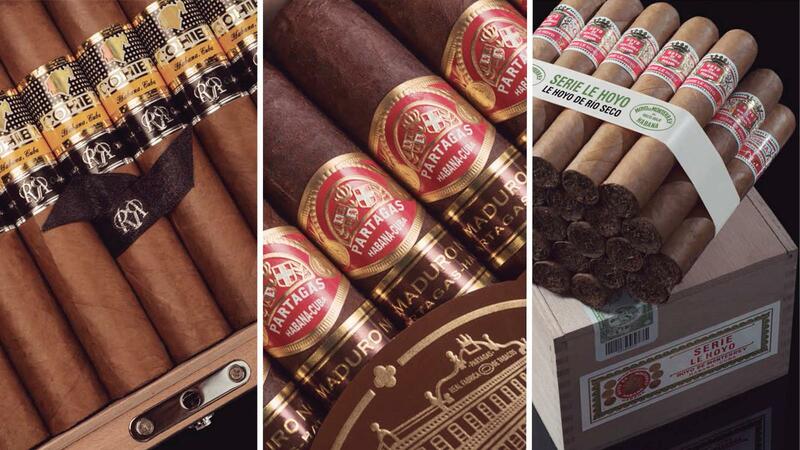 Habanos continues to focus on its retail outlets around the world. There were 144 Casas del Habanos globally last year, 930 Habanos Specialists, 110 Habanos Terraces, 1,900 Habanos Points and 13 Cohiba Atmospheres, according to Cintra Gonzalez. The question was posed whether or not President Trump’s action to limit the number of legal American tourists in late-2017 had any noticeable impact on the company’s sales. The two officials said they didn’t really know, but they did note that Cuba had increased sales at Cuban retail shops, which the company counts as an export figure because virtually all of the cigars in those shops are sold to tourists. Habanos said 2017 sales within Cuba increased by more than 30 percent in 2017 when there was a huge influx of Americans traveling there. The two executives also said they expected 2018 to be another strong year, not just in Cuba, but around the world. They also added that the 2017–18 harvest has been excellent with good quantities of high-quality tobacco, a statistic that has been echoed by early reports from leading Cuban farmers interviewed by Cigar Aficionado.